I once needed more than words to believe in God. I could believe in politicians, championship race car drivers, hall of fame ballplayers, and rock stars because I could see them. The problem with politicians, championship race car drivers, hall of fame ballplayers, and rock stars is they are human. Humans sin and disappoint those who believe in them. In Exodus 19, the children of Israel needed a sign in order to believe all Moses had told them. 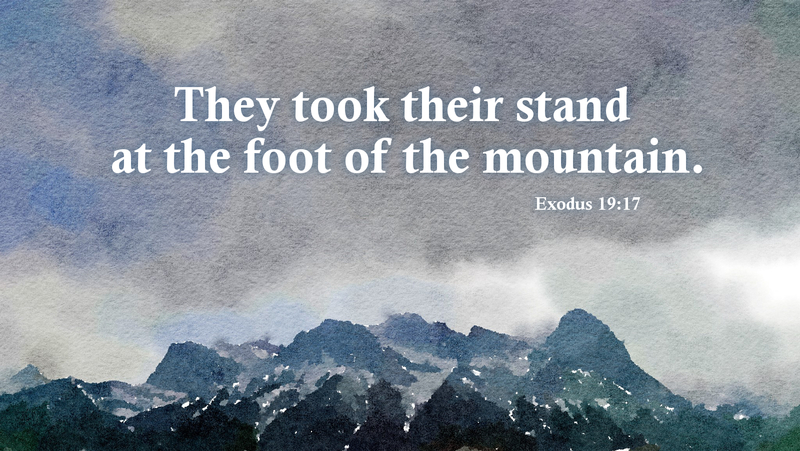 So God had them stand at the foot of the mountain. They could see and hear God in all his glory. We are skeptical by nature. We want to see and hear God so that we can believe. God gave us his Holy Scriptures and we hear, “the voice of one crying in the wilderness,” and the Baptism of God’s only begotten Son so we could believe. In the holy sacraments, we see the people, hear the words, feel the water, taste the bread and wine, and in faith we believe. It is our deepest desire to stand by the grace of God in faith at the foot of the mountain, seeing and hearing the glory of God for all eternity. Prayer: O God, come to us in your glory and remove all doubt in our minds so that we can see and hear you through Jesus Christ our Lord forever and ever. Amen.